Alameda is a gorgeous neighborhood with quiet, tree-lined streets and wonderful historic homes, many on larger lots with lush green lawns. Alamdea provides access to a popular and prestigious community with a strong sense of neighborhood pride. Travel north of Fremont and the symmetric grid-blocks are left behind in favor of streets that run at angles, or some that run circular, along the hilly area called Alameda Ridge. Homes located on Alameda Ridge have a stunning view of downtown Portland, the Willamette River and the West hills. Nearby, in Beaumont-Wilshire, you will find coffee shops, a brewpub, and some nice residential and commercial areas to take a stroll. Centered around Alameda Ridge, the community’s side streets wind around the hill. NE Fremont Street is the neighborhood’s main east-west thoroughfare and NE 33rd its main north-south thoroughfare. Alameda is adjacent to Wilshire Park, a 14.4-acre neighborhood park, and is located between the business districts of Beaumont Village and the Hollywood District. The name "Alameda" comes from the Spanish word "alamo," meaning poplar or cottonwood tree. It precisely means a public walk or promenade lined with poplar trees, and by extension, a street lined with trees. The neighborhood was established on the 1859 land claim of William C. Bowering and wife Isabelle, and later became known as Gravelly Hill Road for a gravel pit at NE 33rd and Fremont. In 1909, the Alameda Land Company laid out the Alameda Park subdivision that was then annexed to the city of Portland. Many residents of the Alameda neighborhood are long established, having grown up there as a child and even still living in the same home. Some of these homes are on the National Register of Historic Places, though the community is not yet registered as a National Historic District. Many people searching for the story of their house come across and participate in the Alameda Old House History blog, run by an Alameda resident and old home researcher. The website features articles of different historical aspects of the neighborhood, memories of former and current residents, questions from new owners about how to research their home’s past, and historical photos from private collections. Wilshire Park - Located right across 33rd St. from the Alameda neighborhood is Wilshire Park, 14.4 acres of outdoor entertainment acquired in 1940. It’s perfectly suited to disabled visitors with disabled access picnic area and restroom. It also has paved and unpaved paths for walking and hiking, a horseshoe pit, playground, and a large off-leash dog area. Picnic tables, soccer field, softball field, and volleyball court are all reservable. Grant Park - Also located on NE 33rd is Grant Park, acquired in 1922 and named after President Ulysses S. Grant who visited Portland three times, rare for a president in the days before air travel or standardized rail travel. This 19.9-acre park features a baseball field, basketball court, soccer field, softball field, football field, tennis court, and picnic tables available for reservations. It also has a disabled access play area and restroom, large off-leash dog area, a fountain, paved and unpaved paths, playground, track, and water play feature incorporated in to the Beverly Cleary Sculpture Garden for Children. Portland artist Lee Hunt created life-sized bronze statues of Ramona Quimby, Henry Huggins, and Henry’s dog Ribsy with fountains installed under Ramona and Ribsy’s feet for kids to splash in during warm weather. As the setting for many scenes in Cleary’s children’s books, the park has granite plaques engraved with the titles of the Cleary books that take place in Portland, and a map of the neighborhood showing where events in the books took place. Alameda Ridge Stairs - ﻿﻿﻿﻿One of the most popular walking trails in Portland is the Alameda Ridge and Stairs. You can enjoy city views and boost your heart rate climbing hidden public stairways in the Alameda neighborhood. This walk is approximately 4.75 miles with between 6-7 stair climbs/descents of between ~70-90 stairs. Interested in the walk? Here is a PDF of the twists and turns of the stair path. Alameda Brewhouse - Just a short distance away in the heart of the Beaumont Village in NE Portland is the Alameda Brewhouse. Offering award-winning handcrafted ales and freshly prepared food for nine years, all beers are produced on location and all meats are hand smoked and roasted. The menu is classic Northwest fare, from traditional pub items like beer battered halibut and chips, steaks, and hand-pressed burgers to the more adventurous salmon gyros and gingered tahini-soy tiger prawn skewers. All soups are made from scratch, and for the vegetarian in you they have their own unique veggie-burger using spent grain from the brewery. 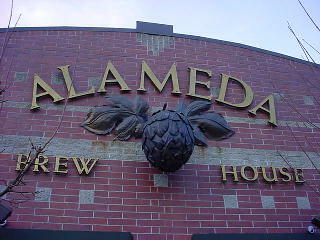 Fresh food and smooth ales combine to make the Brewhouse an Alameda staple and favorite. Alameda Café - For an intimate and unpretentious atmosphere, check out the Alameda Café, a long standing favorite in Portland. Fair prices and perfect portion sizes are appreciated by customers, not to mention the tasty Shepard's Pie or Chicken Pot Pie. Burger meat is hormone free for the best taste and texture a burger can get, perfectly grilled with a side of handcut fries. Peanut Butter Pie is an unbelieveably good dessert to finish up yourmeal on. There’s beautiful artwork hung on the walls, available for sale, and waitstaff that make you feel like welcome guests in their home. They meet any request with a non-oppressive cheerful enthusiasm that perfects the dining experience.